By employing a rectangular mesh the support value of the grid has been increased, offering a value intermediate between the most commonly used grid (200 Lines/") and (300 Lines/"/). Each grid rectangle is asymmetrical having different outlines in all four corners. 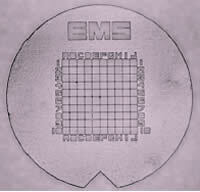 This allows for the orientation of the grid to be determined at microscopic levels. The index feature enables the position of each grid to be identified with reference to the letters A-O along the horizontal axis and the numbers 1-15 along the vertical axis. The logo in the rim allows for precise orientation and aids in the identification of each side. Grids are available in Copper, Copper/Palladium, Nickel, and Gold. Mesh: 200 Lines/" 250 Lines/"
Our unique index grids for all of your microscopy work. These grids are manufactured in the strictest accordance to meet AHERA requirements. 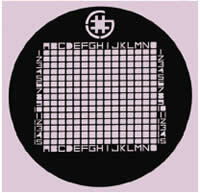 The grids are available in either copper or nickel and there are 100 grids/vial. These two new SEM grids are designed to aid in the identification and localization of SEM specimens when placed on standard SEM stubs. The SEMF2 allows for easy characterization and analysis of particles and suspensions. The SEMF3 uses an alpha-numeric index, allowing up to 25 predetermined specimens to be fixed and then located in a SEM. Referring to the annular rim identifies north, south, east and west. The four quadrant markers are tapered towards the centre. 100 Radial sectors are identified by reference to decimal numbers in the annular rim and alphabet letters in the four quadrants. The larger cells are identified using numbers from 1 – 57. Each large cell is sub-divided into 4, making a total of 228 identifiable cells by reference to their number and geographical location. 25 cells are identified by reference to their alpha-numeric position. The large asymmetric cut-out feature in the rim enables the right view to be easily obtained when placing on a SEM stub.